Contrast is critical for creating images that catch the eye and text that is readable. 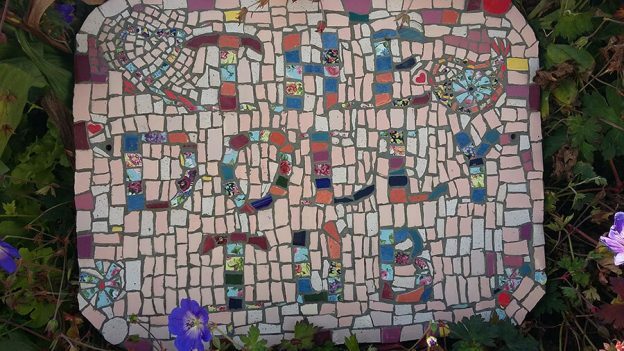 A mosaic sign recently completed by Ann Mitchell is a great example of the importance of contrast and the rewards of looking at your work in an objective way and reworking problem areas. 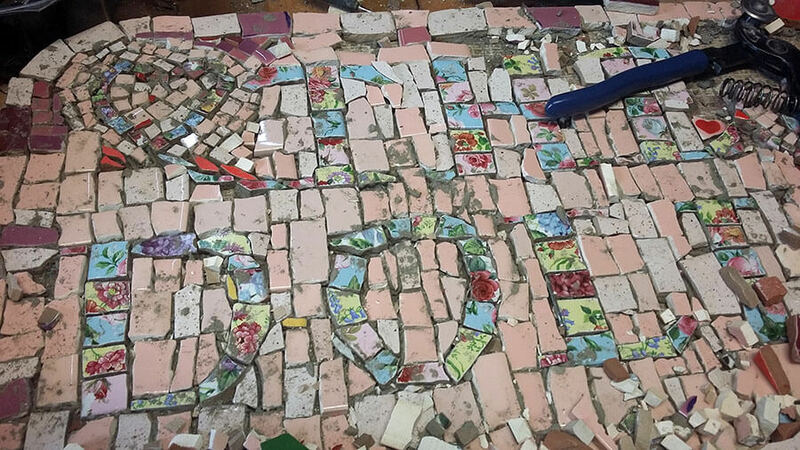 Ann emailed us the picture above asking for recommendations for a grout color that would help the letters stand out better from the background. I replied that there doesn’t appear to be enough contrast between the floral letters and the pink background so that the letters stand out. I told Ann that I would use a gray grout, darker than medium gray, but I don’t think that will help with the underlying problem. Ann then I asked me if I thought she should change the background that took her hours and hours to do. I told her that I would change the background or put some sort of outlining around the letters or something because as they were, they didn’t stand out enough. I actually enjoyed helping Ann because she was obviously learning by trial and error (which is how I do everything), and she was also willing to look at her own work objectively and to spare no effort to fix things that bothered her. 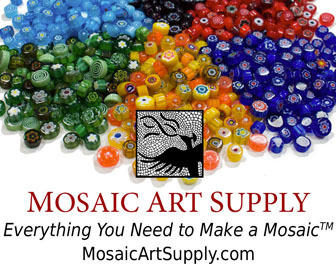 I love found object-mosaic, but when you are trying to make a picture, what the material is in terms of theme or personal significance matters not nearly as much as how it looks. TIP: If you are rendering an image or making a sign, you cannot neglect fundamentals such as contrast and iconic composition merely to a accommodate a clever choice of material such as broken china or thematically-appropriate found objects. Ann used pieces from china dinnerware to make her letters, and I don’t think these plates had any personal significance for her, but sometimes artists will use materials that have emotional value, such as pieces of their grandmother’s teacups. Materials with emotional significance can be a problem because they cloud your ability to see the artwork objectively. If the pieces of broken teacup are white, you shouldn’t use them in a place where white tile tile doesn’t look as good as some other color. Design a better project around the pieces of your grandma’s teacups or use them somewhere else maybe. 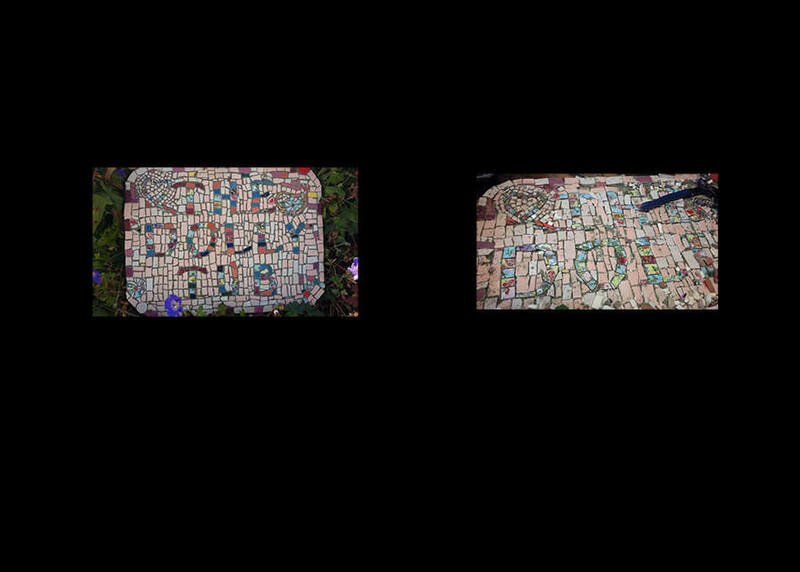 Thumbnail Squint-View of Mosaics, before and after revision. Thumbnails are probably the best way to see your art with fresh eyes and see it “at a distance” and evaluate composition and contrast. You can zoom in and out, and that is enormously useful in itself, but you can also use photo editors to play with hue and value and experiments with contrast. I could tell Ann’s original version didn’t have enough contrast when the text in the thumbnail was unreadable. Look at it in the morning and trust your initial impressions, not your later thoughts about what you were intending to accomplish. Look at it from multiple angles in succession. Snap a digital photo of it and look at the image as a thumbnail. Use photo editing software on the image to convert it to black and white. Use photo editing software on the image to experiment with different color schemes. Remember to listen to your art and go where it needs to go instead of forcing your original ideas on it. This entry was posted in Art Review, Improving Your Art and tagged design considerations, troubleshooting on September 29, 2017 by Joe Moorman. I created a beautiful photo realistic glass mosaic portrait of my grandson, and I used too dark of a grout (mocha). Without removing the grout, can I paint over the grout with a lighter color acrylic paint?